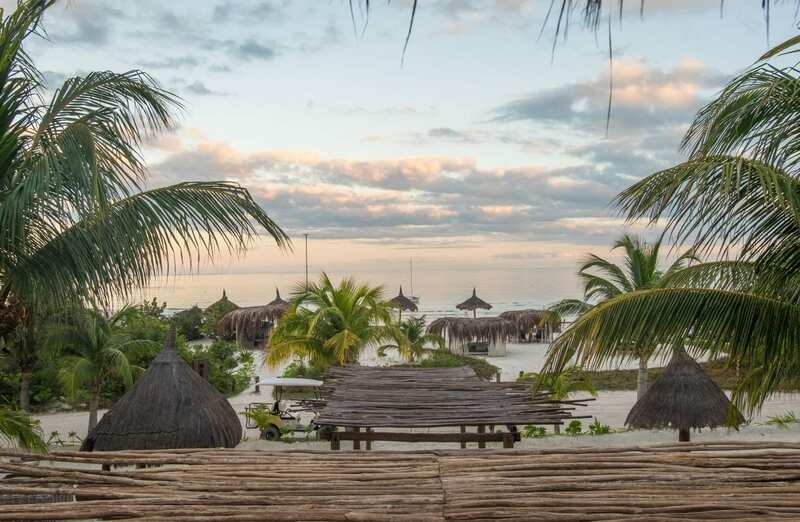 I always knew I would travel to Holbox on my next trip to Mexico — thanks to the fervent recommendations of my friends. 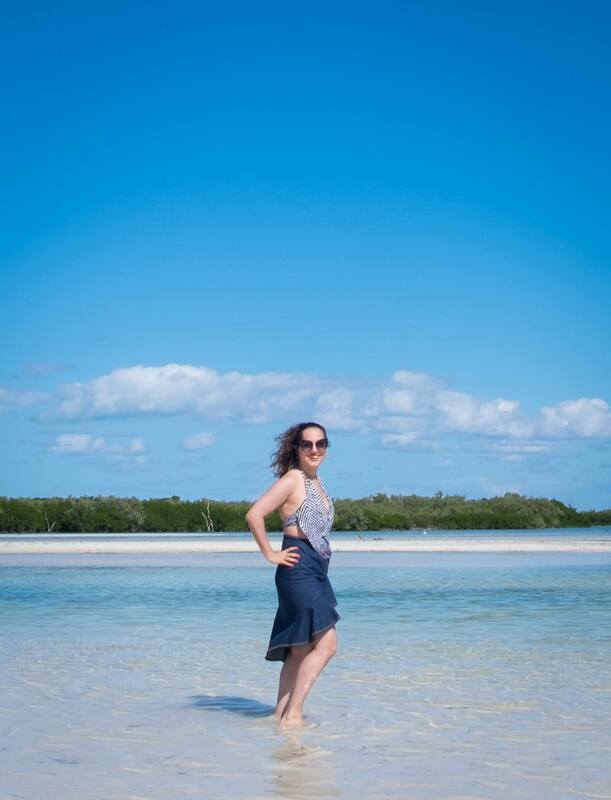 A few years ago, when tons of travel bloggers were living in Playa del Carmen, many of them told me that Isla Holbox (pronounced HOLE-bosh) was their favorite place in the region. And if you’re already living in a beach resort town but go to a different place for your beach holiday, well, that place must be special. I planned to hit up the Caribbean in January — an escape from the brutal New York winter and a chance to recover in between the holidays and my work conferences. Then my friend Bianca told me she was going to be in Mexico in January, and how about I join her for a few days in Holbox? What a lovely idea. Back in 2015 I went to Tulum with my friend Erisa and I expected a bohemian community with beach huts and cheap eats. It wasn’t anything like that. Tulum is a city, complete with traffic jams and hordes of tourists, and unpredictable weather had turned its trademark turquoise waters a murky brown. We had a lot of fun — even though I only wrote about that trip in the monthly recap. We ate fancy mole, drank Thai margaritas, biked to the Gran Cenote and swam with turtles in Akumal. But Tulum wasn’t what I expected — it was busy, it was commercialized, it was hectic. Holbox is EXACTLY what I thought Tulum would be. Imagine a tiny island filled with dirt roads. The only way to get around is by bike or golf cart. Buildings are covered in murals. Street vendors serve up every kind of taco you can imagine. The downtown is lined with ramshackle restaurants, a few bougie boutiques peering out in between. Here’s what you won’t find — bars with drinking contests, Bali-style stores selling shirts that say UP THE BUM NO BABYS, chain hotels. Or any chains, for that matter. 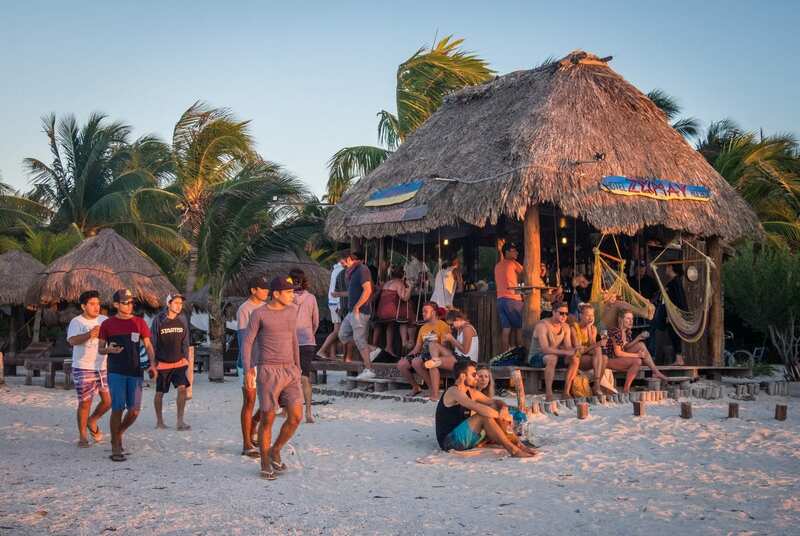 Everything on Holbox is small and local — and they intend to keep it that way. More on that a bit later. And then you get to the beach, and sure, there’s a thick layer of seaweed on the shore that every Instagrammer seems to crop out, but once you get past that, it’s truly exceptional water. So clear. So turquoise. And so shallow! 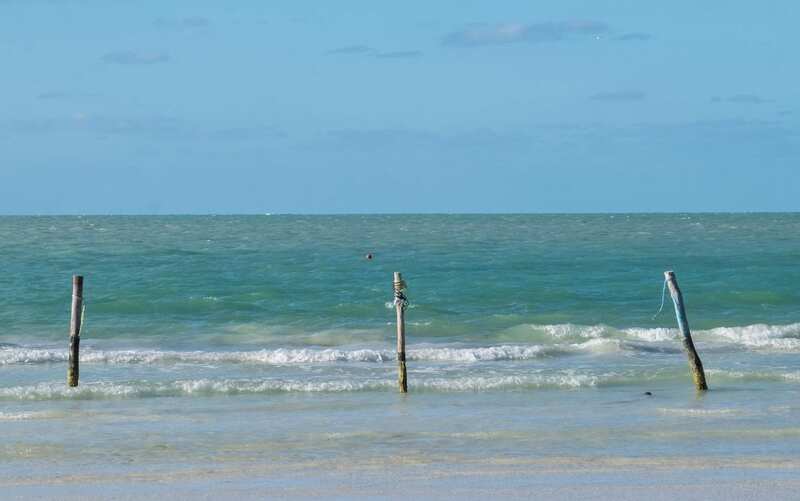 I may have seen brighter shades of turquoise before — I still think the neon waters of Belize rank first — but in Holbox you can walk fifty feet out and the water won’t even reach your knees. The beach scene is great, too. What I love is that you can find a chair on the beach and just chill out without anyone bothering you. I love how casual it is here. 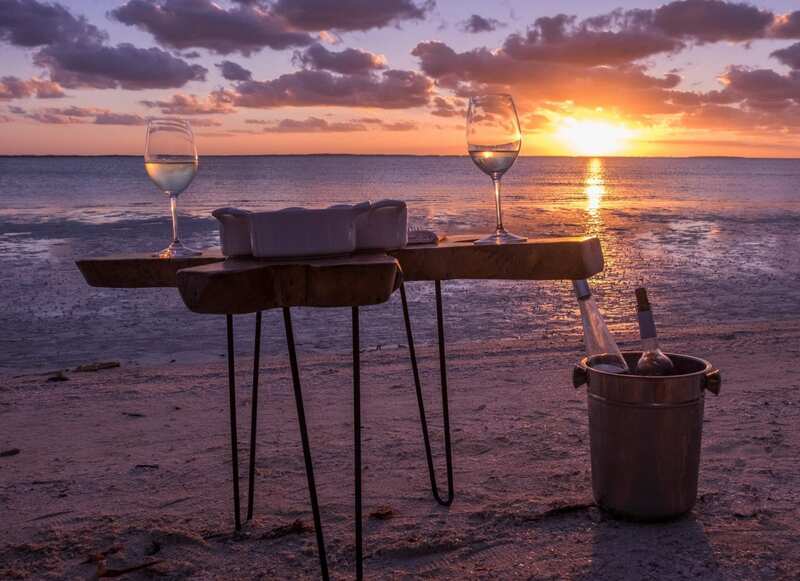 Go to a similar environment in Thailand, and as soon as you sit down on a beach chair, vendors will be chasing you with menus or trying to get you to pay for the chair. Not here. You can just sit. This is one of the few places I’ve been where you can sit down in a chair and nobody cares or chases you down. Even the vendors selling on the beach and don’t come up to you directly — they just walk by announcing what they’re selling, and if you’re not into it, no problem. 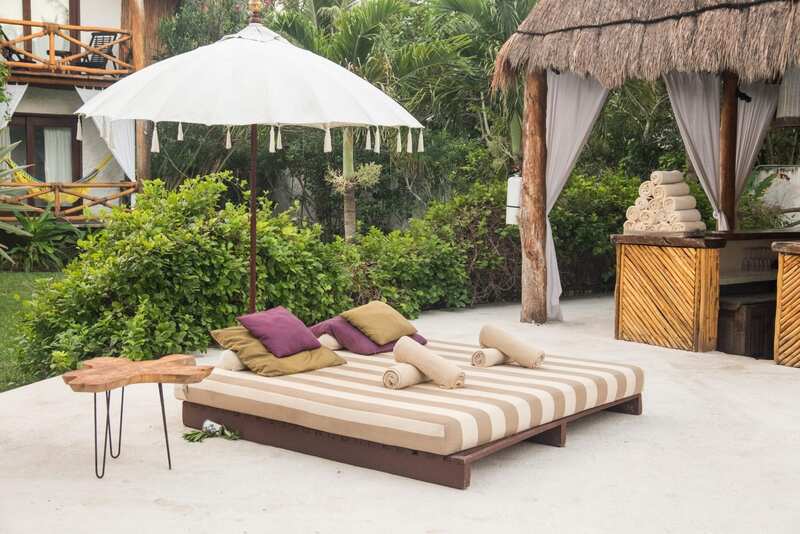 Find a day bed with a sun-shielding palapa on top and you’re good for the day. As for the people, this is definitely a gringo destination. 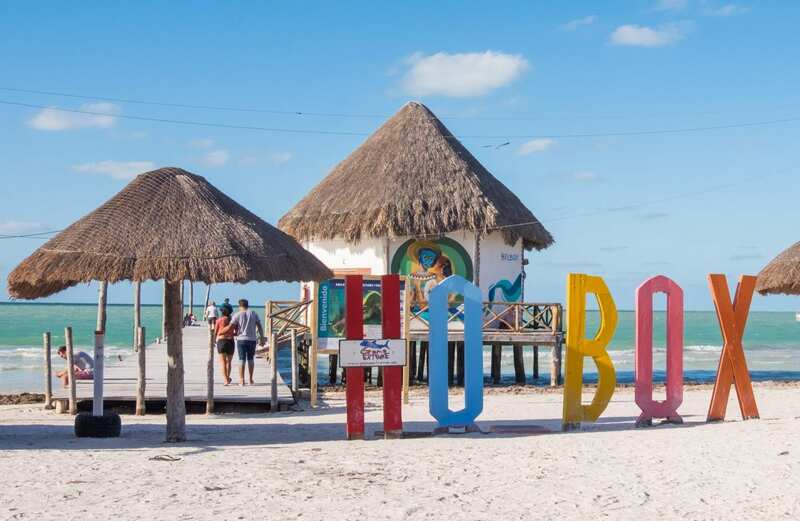 Some beach destinations in Mexico cater to Mexican travelers as much as international travelers, but Holbox is not one of them. While there are plenty of Mexican locals and some vacationers, you don’t see hotels full of Mexican families like you do in Cancún. Among the international travelers, I saw very few people of color. It’s a different kind of clientele — everyone here is an independent traveler. Even the parents with babies are independent travelers who grew up and had kids. Not the kind of people who need to be hand-held while in Mexico. The people I did meet in Holbox were amazing. One of my favorite instances was when I was looking for a Telcel store to get a SIM card, and the store I was directed to happened to be closed. As I was leaving, a local woman came up to the store and was disappointed to see it was closed. She told me to come with her and we walked a few blocks away to another Telcel store. We chatted as we strolled, then she said goodbye at the door. “Wait, you’re not going in?” I asked. “No, I just wanted to make sure you got there,” she replied. 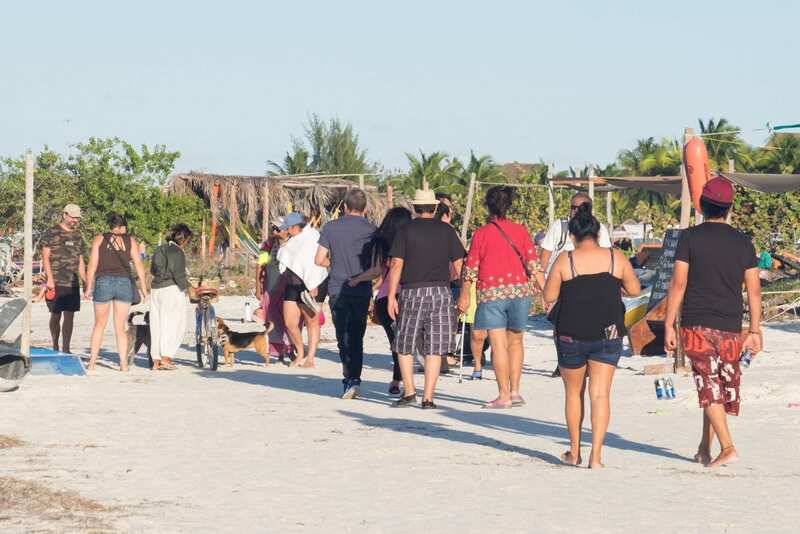 In October 2018, Holbox became the first island in a Protected Natural Region of Mexico to ban single-use plastics. Seriously!! How amazing is that?! I found it notable when I first got to Holbox, ordered a mojito, and wasn’t given a straw — then I was delighted to hear that this was a new policy throughout the island. They won’t give you plastic cups, plastic bags, or plastic coffee-stirrers, either. And that’s not all — they also launched several sustainability initiatives, including reducing wastewater dumping and banning tourists from bringing nonbiodegradable items to the island (though they didn’t check our luggage). The big one? They banned new construction. 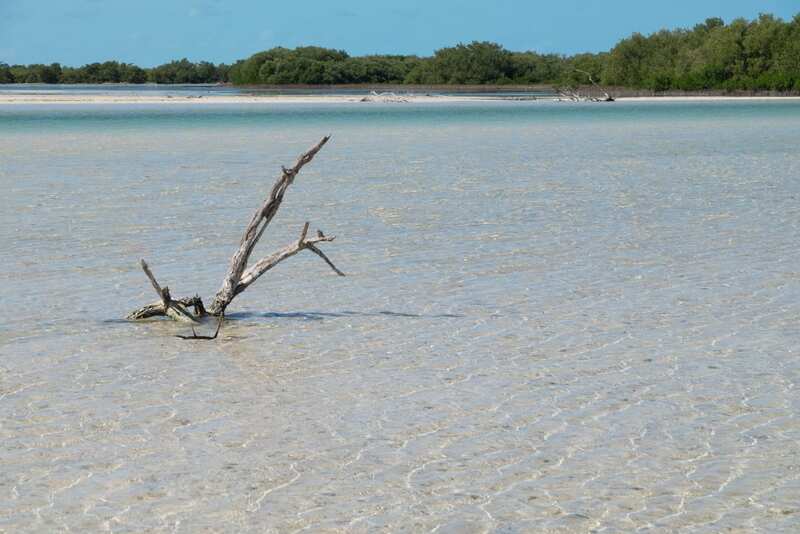 Holbox has tons of land that could easily be developed into resorts, golf courses, luxury rentals. But thanks to a construction ban, they’re not going to let that happen. The island is simply going to keep what they have and use that. 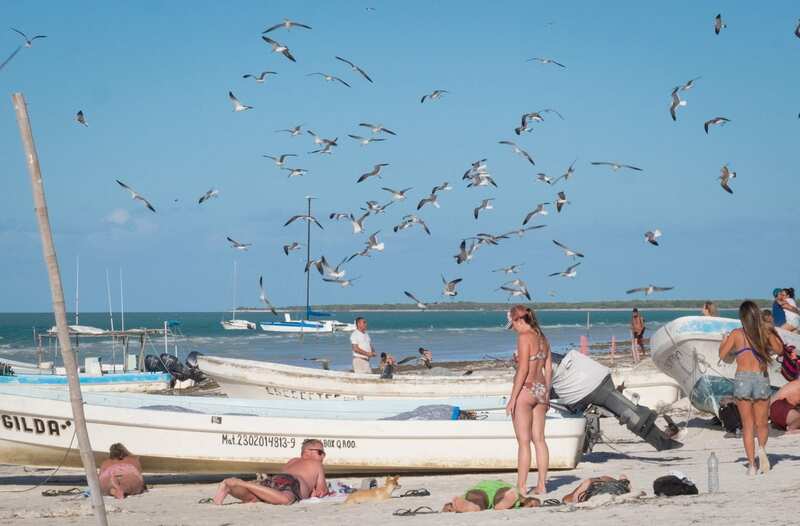 I’ll be honest — when I first got to Holbox, I felt nervous about promoting the island. It seemed like it was right at the spot where tourism was about to explode. Overtourism was the last thing I wanted to see here. After learning about the single-use plastics ban and construction ban, I feel like I can promote Holbox in good conscience. 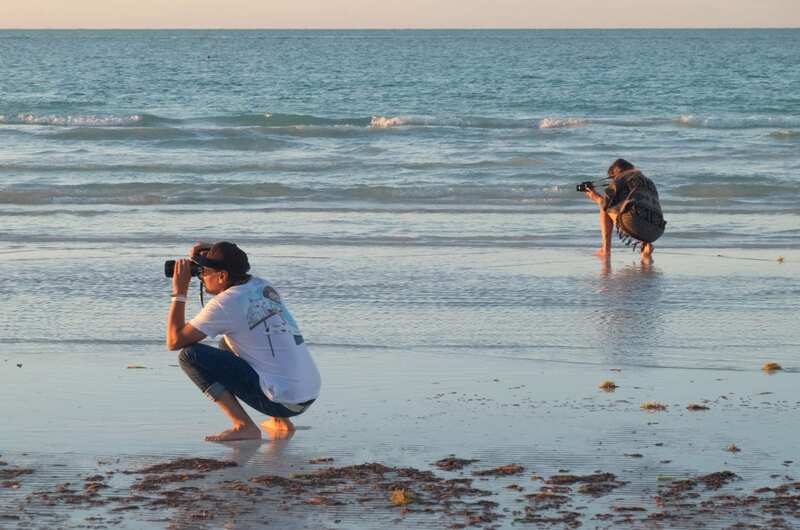 I’m proud to send you there, my dear readers, and I hope more islands follow Holbox’s example. 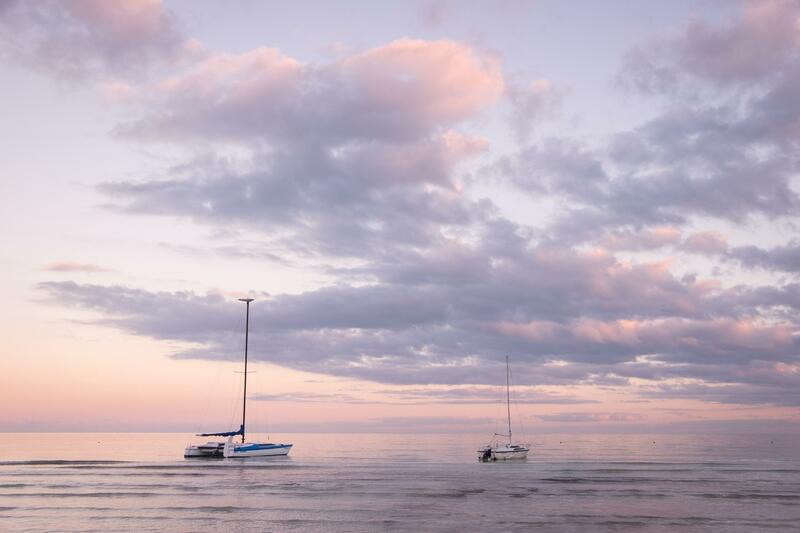 One thing is for sure: island communities LOVE their sunsets. Every night it becomes the hottest show in town. Holbox is no exception. My first sunset was at the most iconic sunset spot on the island: Punta Cocos. Being on the western edge of the island, this is where everyone comes out for sunset. And your photos will be spectacular. Do note that the mosquitos here are FIERCE as soon as the sun begins to set. I urge you to wear long pants and sleeves and bring mosquito repellant. One got me in the middle of my forehead! Don’t walk here — come by bike or golf cart. It’s a long walk back. And if you come by bike, be sure to leave right after sunset so you have enough light to get home. Keep in mind it’s rustic on this island. There are no streetlights. 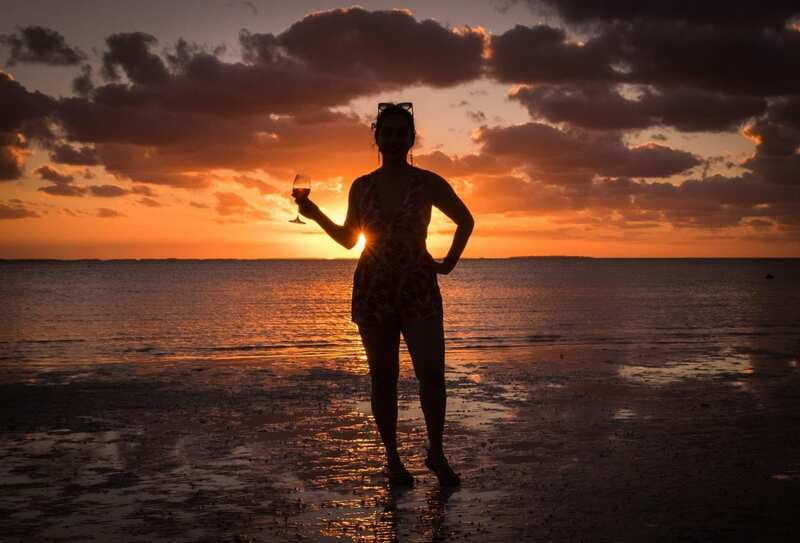 My friend Bianca does PR for a tiny boutique hotel on the island called Casa Sandra, and she invited me to come along with their team for sunset. If you stay at the resort, they drive you out and set up comfy chairs and wine. It brought me back to our sundowners in Kenya! My second sunset was at a casual bar on the beach called Raices. I had no idea at the time, but apparently this bar is famous for being cheap and cheerful. I ordered a Sol beer, paid 30 pesos ($1.50? Yes please), and sat down to watch the sun sink into the horizon. 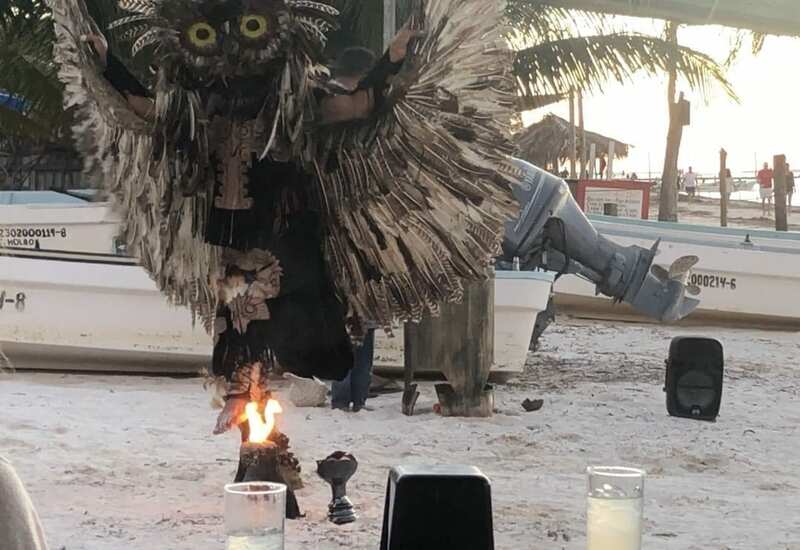 An indigenous man performed a dance in an owl costume and even put his foot into the fire. I didn’t take photos here — it didn’t feel necessary after last night’s show, and as someone whose job it is to GET PERFECT PHOTOGRAPHS OF EVERY SUNSET POSSIBLE when on the road, sometimes it’s nice to lean back and say, “You know? It won’t be the end of the world if I don’t get this one. But I do like photographing people who photograph the sunset. My third sunset was definitely the local option. A new friend of mine named Lucie invited me out to a bar called Zomay. 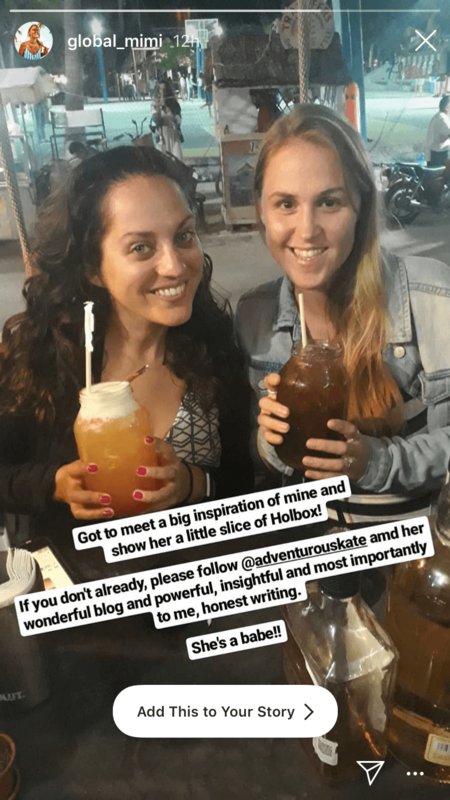 Lucie is from the UK, she’s been spending much of the year on Holbox for years, and she has blogged about it here. 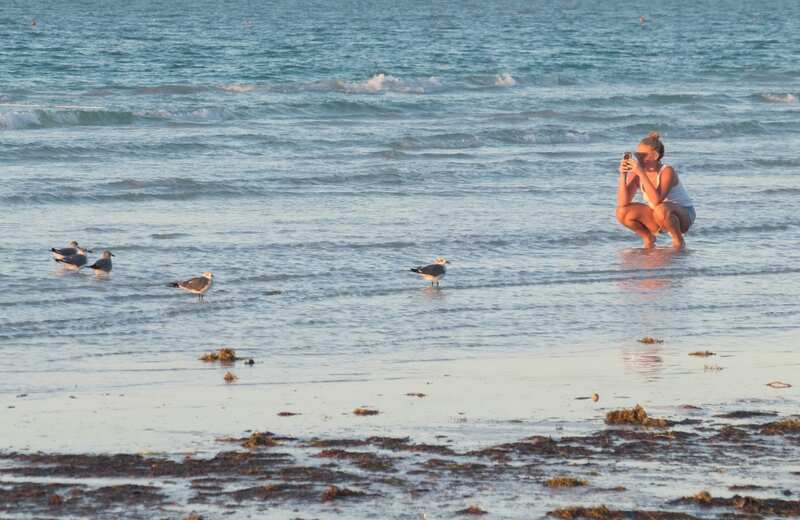 Do check out her Instagram — she has such beautiful images of Holbox! There were times in my life where I could imagine myself settling down in a beach community for months at a time. Koh Lanta, Thailand. Sihanoukville, Cambodia (ew, in 2010, not now). Little Corn Island, Nicaragua. Playa el Tunco, El Salvador. I couldn’t imagine myself doing that anymore — but the beach life still looks pretty sweet when you view it from this angle. That sunset turned into a NIGHT. OUT. With cocktails the size of our skulls, consumed while sitting on swings. Mine was a Mai Thai and I’m pretty sure Lucie’s was a Long Island. After having a sunset cocktail at Zomay, we went to Barba Negra for dinner. They have great tacos — their vegetarian cauliflower tacos are HUGE, and we had some cilantro margaritas. Next up was Pura Vida for the aforementioned giant cocktails on swings, and later we joined the crowds at Hot Corner. 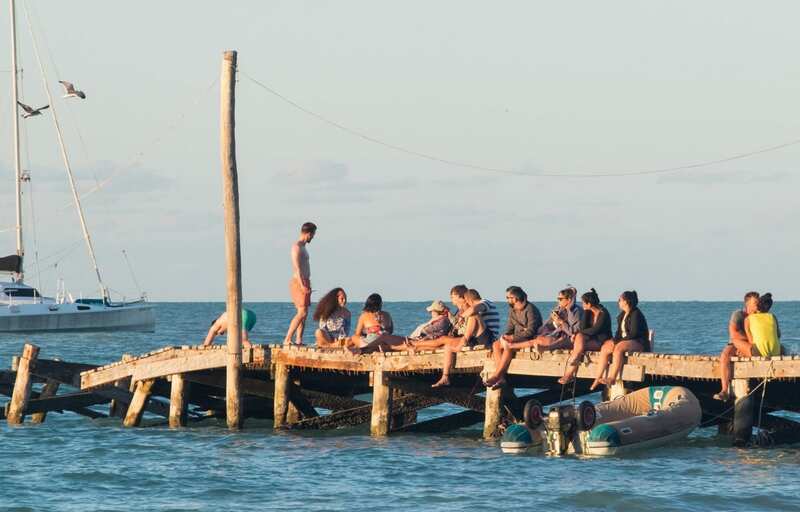 Holbox doesn’t have a crazy club scene — it’s more of a casual bar night out. No need to dress up — just grab some drinks and enjoy your night. You can even buy cheap drinks at the convenience store and hang out drinking them in the street. Exactly how a beach town should be. Oh, and don’t forget to catch at least one sunrise! 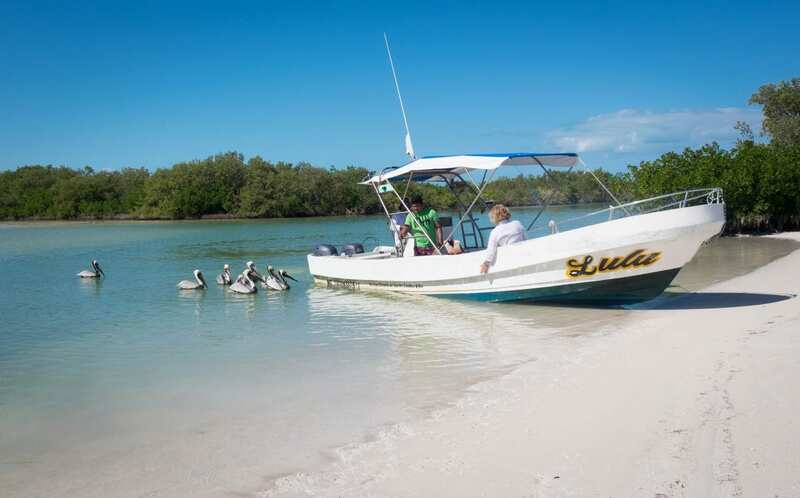 One of the popular day trips from Holbox is to do a multi-island tour around the region. Lots of companies sell this tour throughout Holbox; I joined Bianca on her tour through Casa Sandra. Cabo Catoche is home to a beautiful soft white sand beach. But the real magic is when you go down the river that bisects the island. 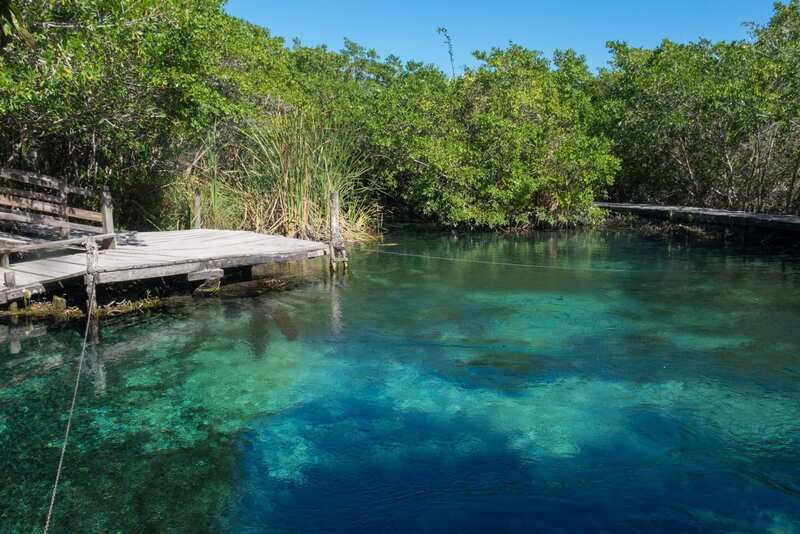 While the ocean water off Holbox is insanely clear and shallow to begin with, that’s nothing compared to this river. It’s even more transparent and the water barely went above my ankles. Another nearby island has a cenote — a sinkhole formed by the collapse of limestone. Cenotes are common throughout the Yucatán region. And if you don’t mind deep water, they’re so much fun to swim in. Cool and refreshing without any salt. Holbox is a place where you can swim with whale sharks. Keep in mind that whale shark season is from June through September with July and August being peak season. Another seasonal activity is seeing the bioluminescence — tiny, magical lights filling the water. This dovetails with whale shark season — June through August — and you’ll want to do it on a night where the moon is full or near-full. 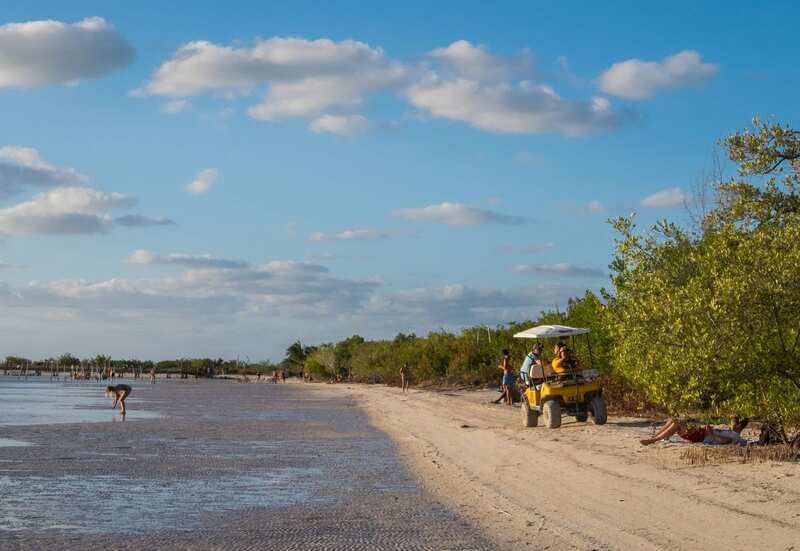 There are kayak trips available, and paddleboards to rent, and you can definitely rent bikes or a golf cart, but Holbox is not a place to go overboard with activities — so much of the fun is just sitting back and enjoying it. 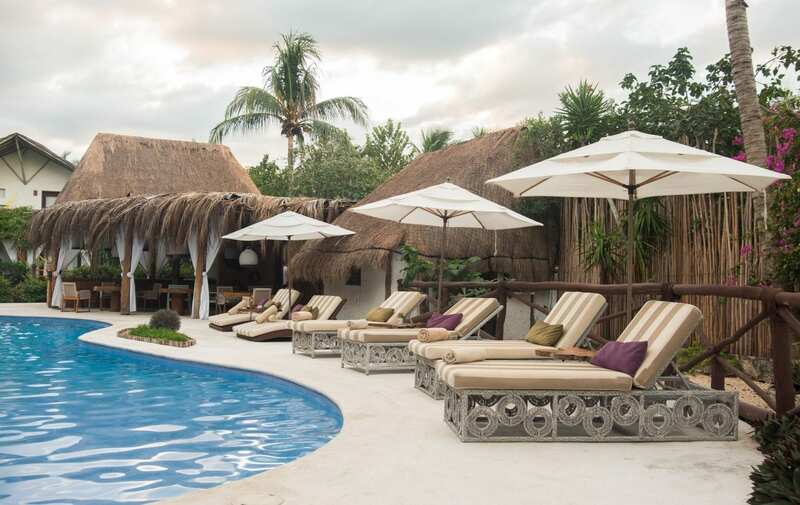 I spent two of my four nights in Holbox at Casa Sandra (Ser Casasandra), one of the absolute best properties on the island. My friend Bianca does PR work for the hotel and invited me for a complimentary stay. I can tell you already that I will be back, because this is one of the best boutique hotels I’ve stayed in — and for $314 per night, I think it’s excellent value for money. 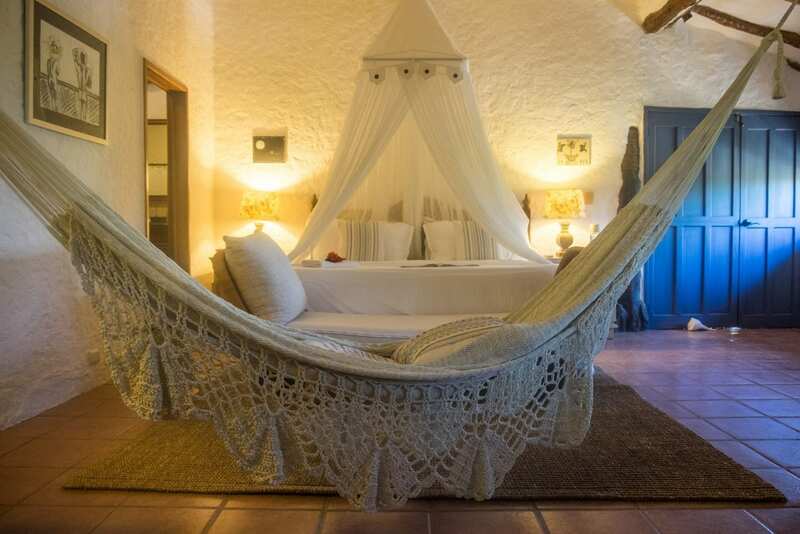 Casa Sandra is a tiny boutique hotel — it only has 18 rooms! You’ve got to book far ahead for this reason. Everything about this property is dreamy. It’s all designed so carefully, with a local, rustic look that blends into the island but is still gorgeous. The staff are excellent — some of the best hospitality industry folks I’ve met in recent memory. And there are touches — the green juices they bring you when you arrive, or when you get back from a trip. The giant plates of guacamole that you couldn’t possibly finish on your own (and I have tried). 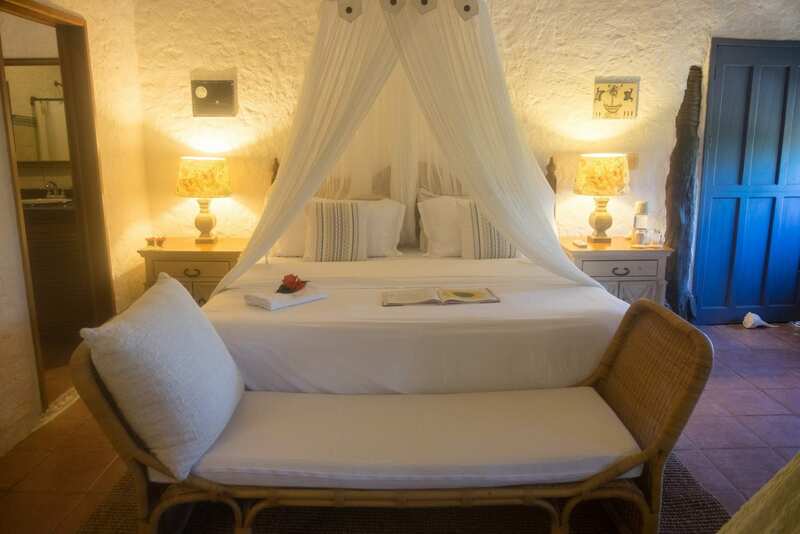 I loved the design of my room, especially the romantic netting around the bed. I loved that there was a hammock in the middle of the room! And because it’s rare — there are hot water showers at Casa Sandra, which is not always given in an island environment. The pool area was beautifully designed and I loved the color scheme. 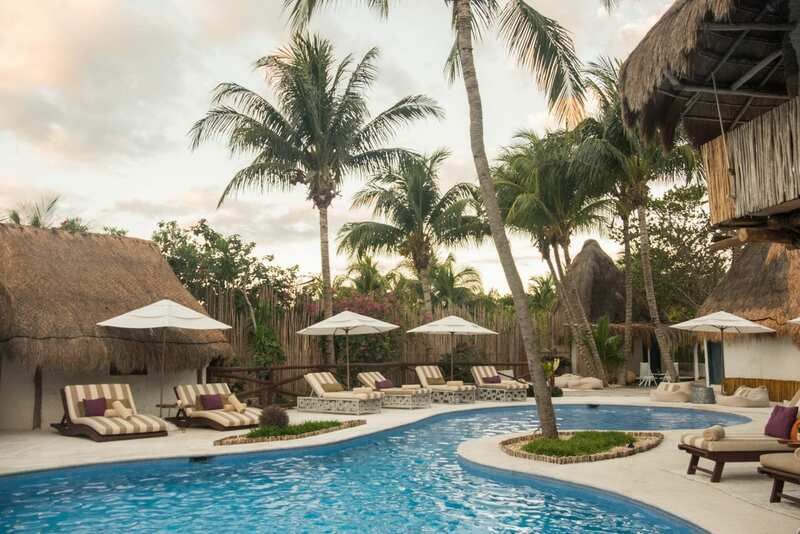 Holbox is a low-key island, but it can be nice to escape the beach and retreat to this backyard. And it’s right on the beach, complete with a selection of comfy daybeds and lounge chairs, some out in the sun, some mercifully shielded. I got through a few books on one of the shaded day beds! There are evening programs each night. 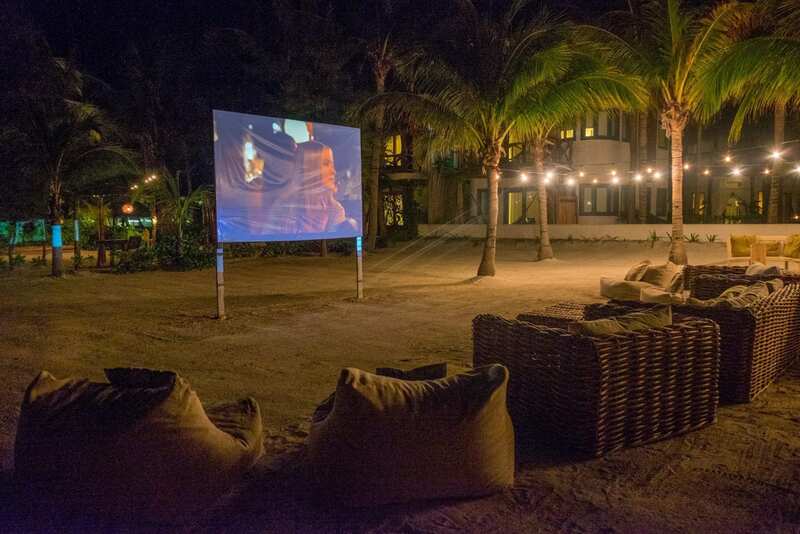 One night there was Cinema Paradiso — an outdoor movie screening. (It was Across the Universe the week I was there.) Another night it was Two Tenors — two outrageously good singers who sang so beautifully, but also looked like they were having a blast doing it. Singing opera was a beautiful background while we were having dinner. My favorite time of day was breakfast. 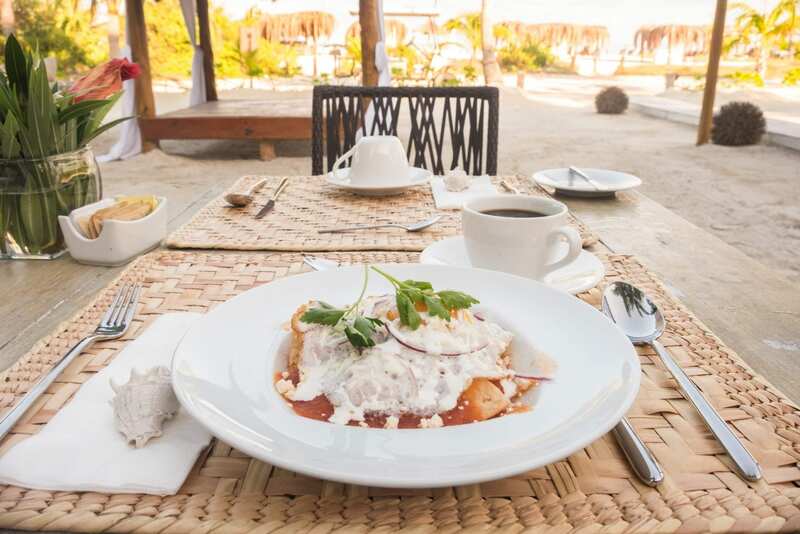 Walking out to the front of the property, enjoying the ocean breezes and view of the sea, and ordering coffee and chilaquiles. 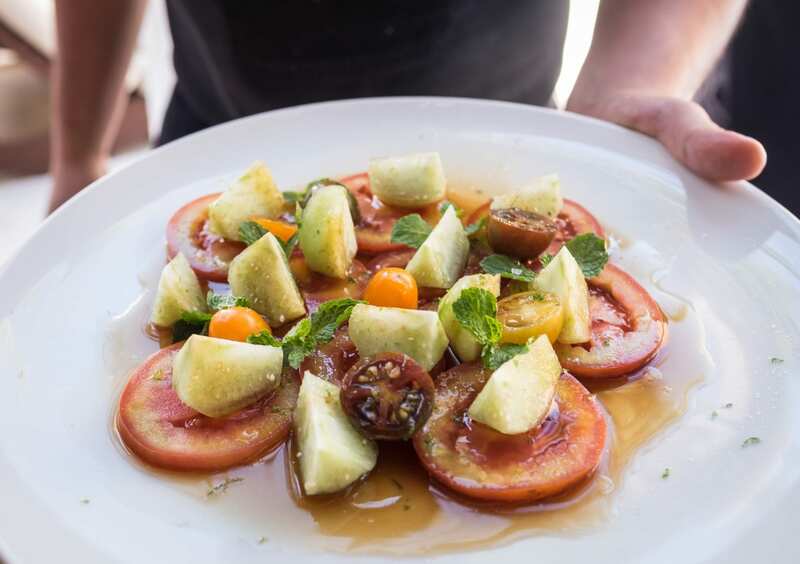 Casa Sandra is also a good spot if you’re a foodie — the food here is exquisite. 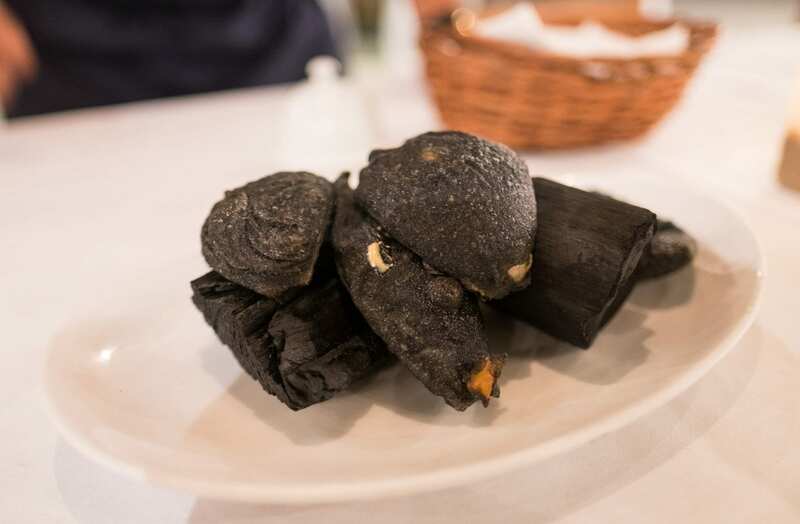 The Yucatán is becoming one of the new culinary hotspots on the planet and some of the chefs here trained with Chef René Redzepi of NOMA. 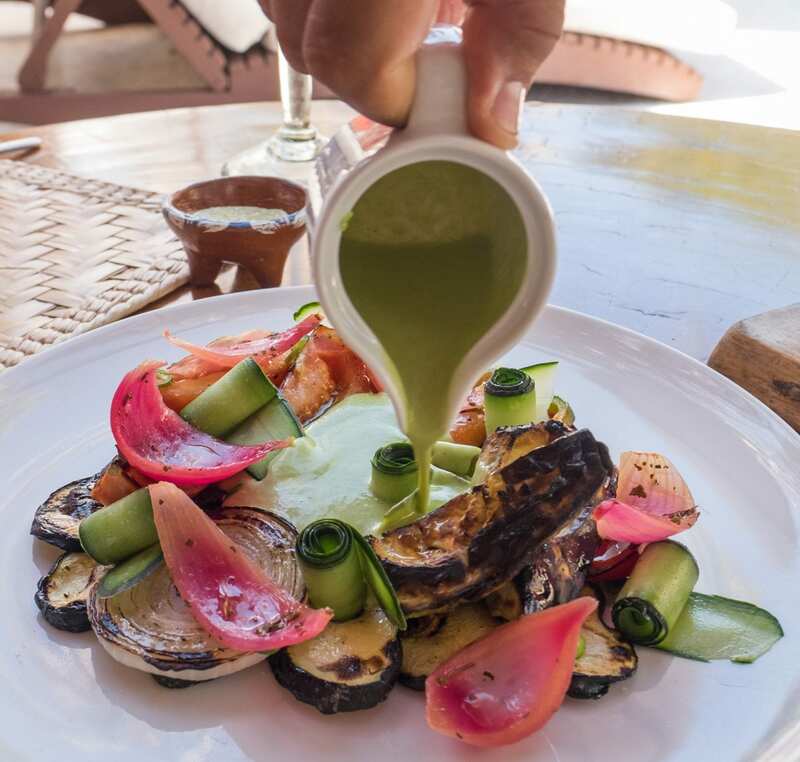 That picture above is a simple plate of grilled vegetables — and it rocked my world. These black shrimp were fantastic as well. 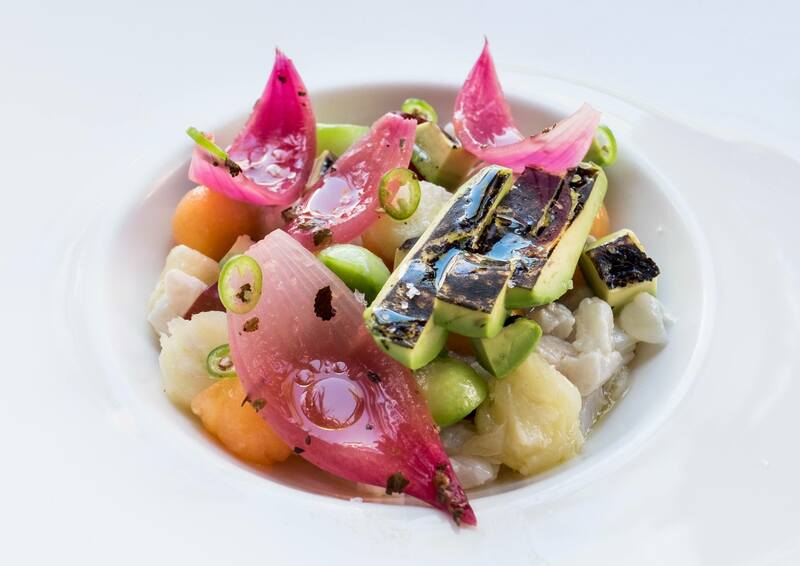 Ceviche can be a simple food — fish, tomatoes, onions, lime juice, salt — but if can be complex as well if you play with acids, sweetness, and textures. 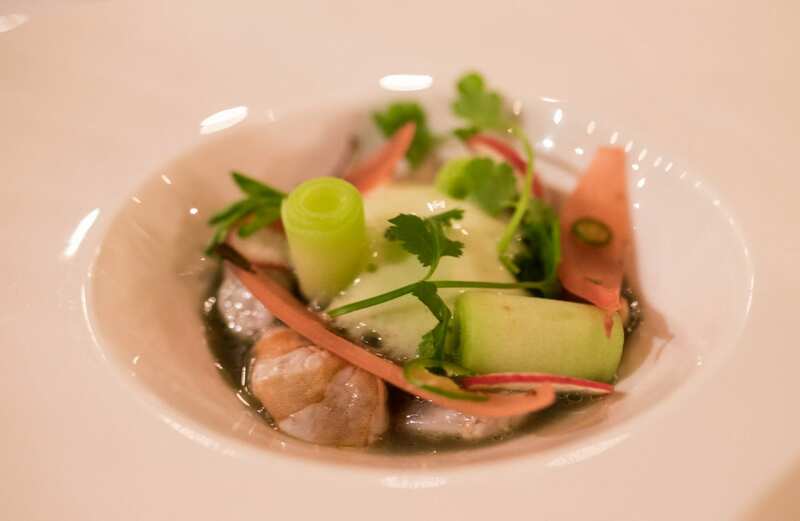 These were the fanciest ceviches I’ve ever had. 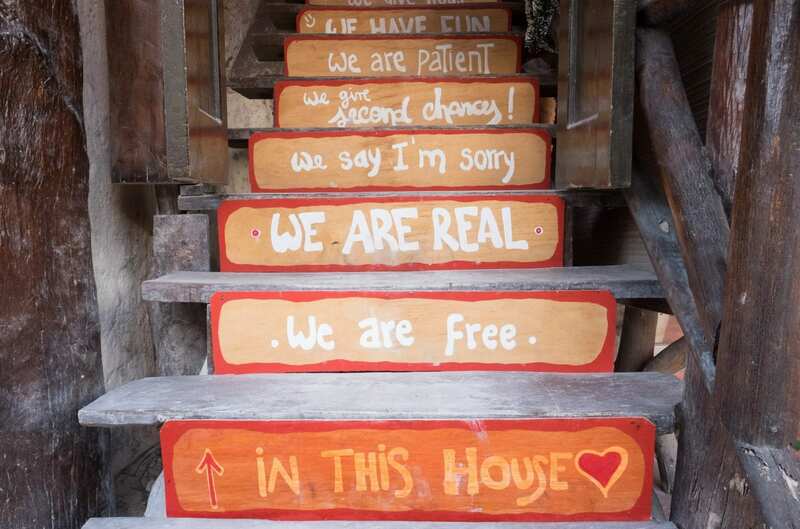 I loved Casa Sandra and I am eager to return and stay for longer. It’s ideal for a girls’ trip — I just need to convince my girls to come with me! 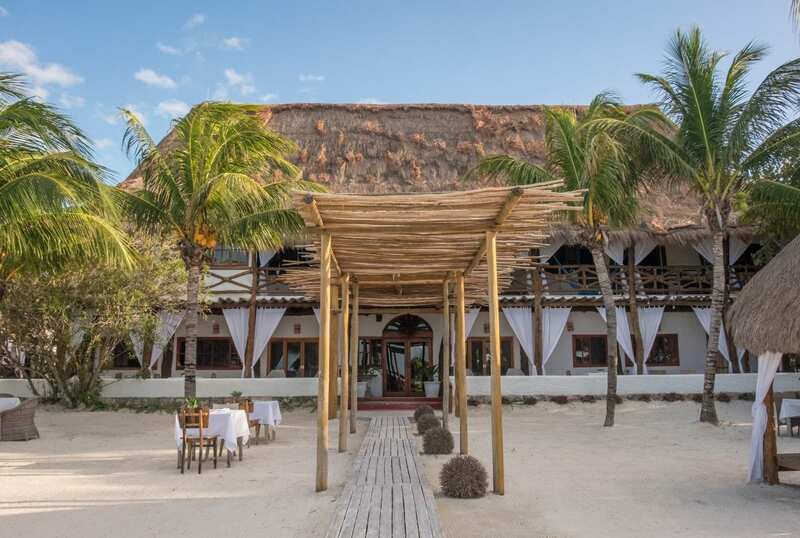 I feel like it’s the best of both worlds, placing you in the heart of chilled out Holbox but also being a quiet, upscale retreat that you can enjoy. There were a few areas for improvement that I brought up with the staff. The hot water was unpredictable, going in and out, and sometimes the water would stop altogether, making washing my hair a thirty-minute ordeal. The wifi is mediocre — better than most places on the island, but so weak I couldn’t even load Gmail (I attribute this to the island environment more than the hotel). Housekeeping tidied up by putting my items in drawers and cabinets — so well intentioned, but I ended up tearing the room apart looking for my jewelry and charger. And I hated the rug in my room — it looked good and fit the aesthetic, but it was painful to walk on barefoot. Overall, small things, and nothing that would keep me from returning. For the first two nights, I stayed at Hotel Paseo Kuka, a simple mid-range guesthouse. I had a simple, decent private room with no air conditioning, a somewhat hard bed, and a cold-water shower. (I don’t mind cold showers in hot environments but it can get quite cool in Holbox.) The staff were lovely. It was two blocks from the beach, about a ten-minute walk from the main drag, and around the corner from Casa Sandra. This was the cheapest private room I could find with a not-terrible rating and I paid $76 per night, including taxes. 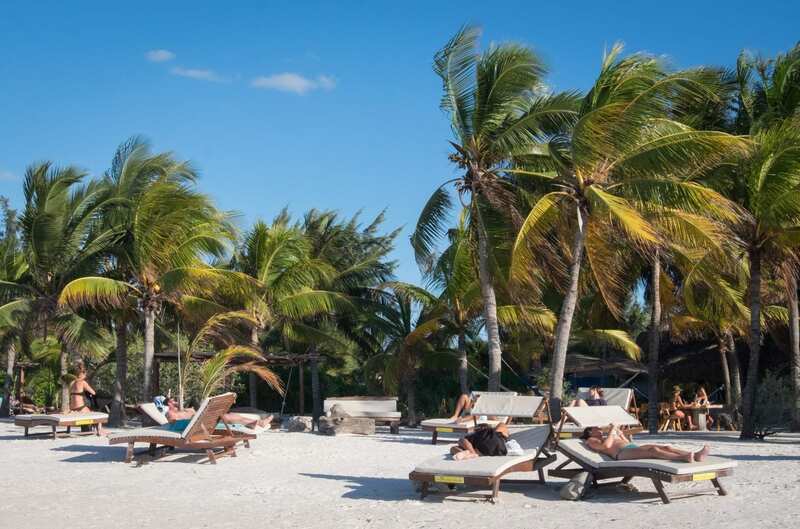 Check out Holbox hotels here; if you’re booking in advance, I’m sure you can find something cheaper. 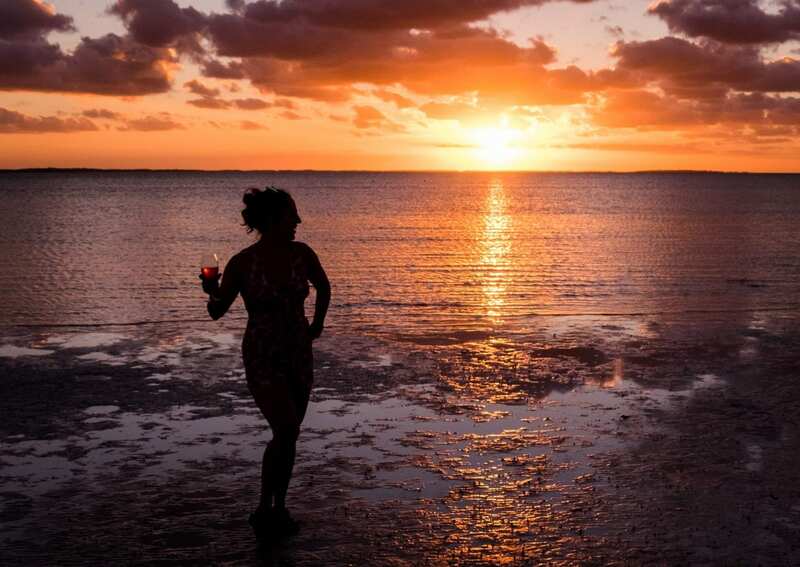 If you’re looking to stay in a hostel in Holbox, Lucie recommends Tribu Hostel. Honestly, if you want to stay somewhere nice but can’t afford it for your whole trip, I recommend spending the first part of your trip at a cheaper place. Spend those days doing activities and getting to know your destination– then get to the fancier place and just LOUNGE. 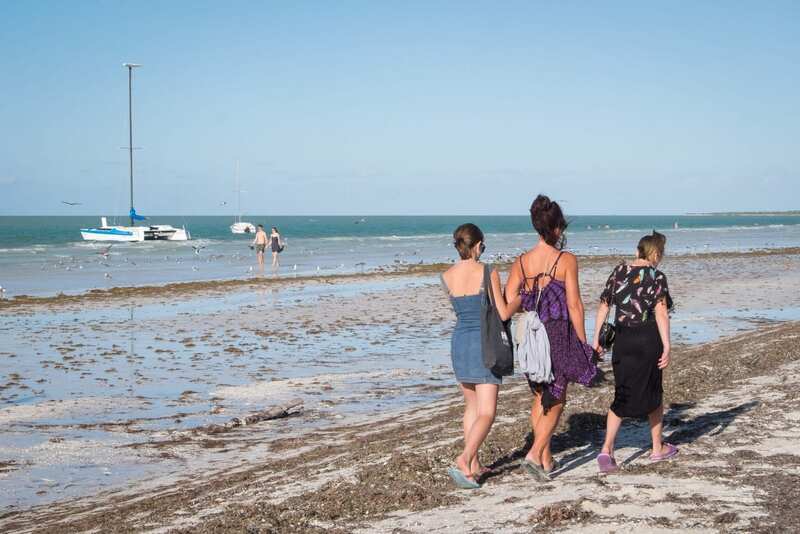 The easiest way to get to Holbox is to book a shuttle van to the ferry in Chiquilá. A handful of companies run this route from destinations like Cancún Airport, Cancún, Playa del Carmen, and Tulum. I booked mine from Cancún Airport with The Holboxeno for $40. Private transfers start at $113. 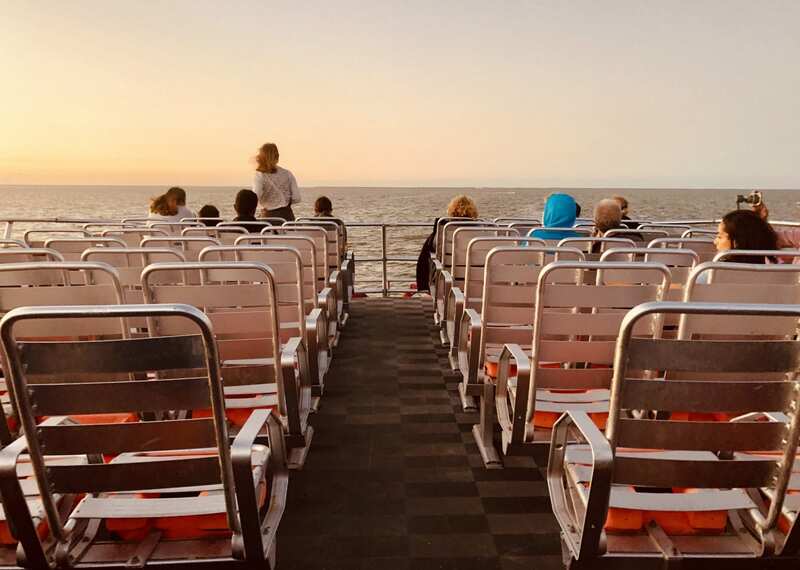 The ferry from Chiquilà to Holbox runs every 30 minutes from 5:00 AM until 8:40 PM. It costs 140 pesos ($7.31) each way. Keep in mind that no cars are allowed on the island. If you have a rental car, you’ll need to leave it parked in Chiquilá. They have several garages. 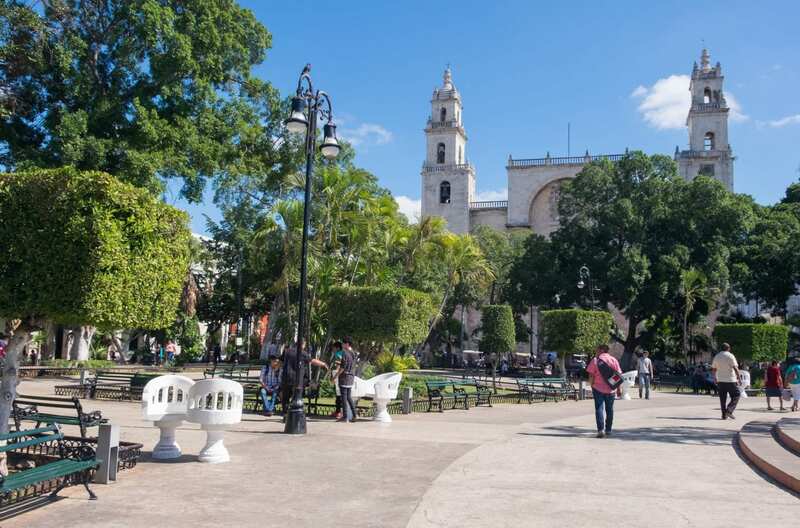 Valladolid — I love the slow vibe and peaceful parks of this small city. You’ll have easy access to the Chichen Itza ruins. It’s a 2.5-hour bus ride from Chiquilá. Mérida — A larger city with colorful streets, a calm vibe, and the best culinary scene in the Yucatán. Plus a variety of cool towns and cenotes nearby as well as an international airport. It’s a 4.5-5 hour bus ride from Chiquilá. 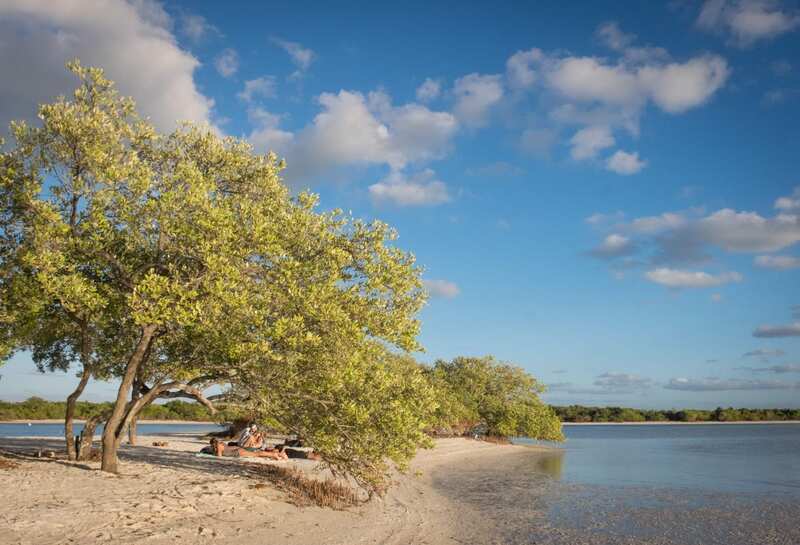 Bacalar — For a completely different beach experience, head to Bacalar, a lagoon. 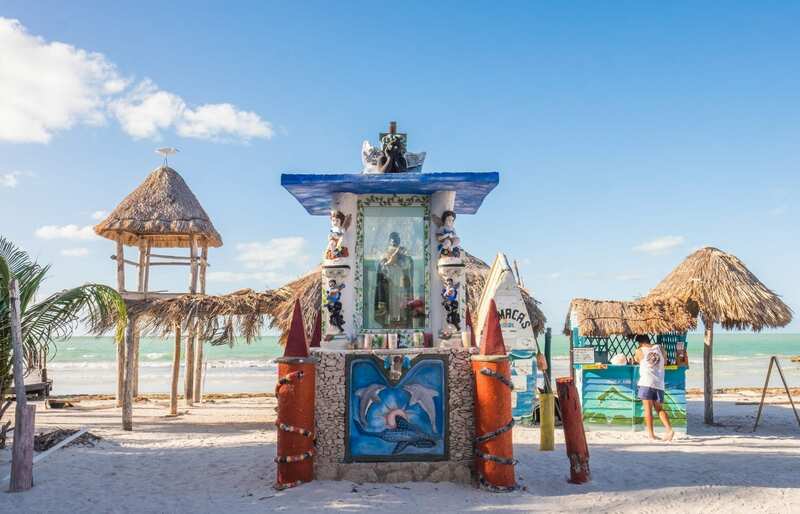 Like Holbox, it’s another gorgeous experience — but unlike Holbox, it’s popular with Mexican tourists and much more budget-friendly. 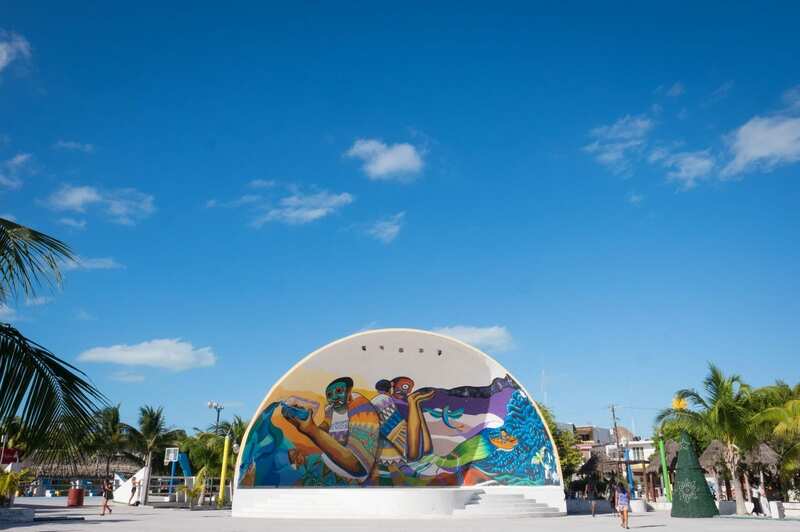 It’s a 7.5-hour bus ride from Chiquilá and you’ll need to switch in Playa del Carmen. I’ve already decided that I’m coming back to Holbox. Ideally with friends or loved ones. This little town has everything that I’m looking for in a Mexican beach getaway — it’s a low-key environment, it’s small but not too small, it’s full of independent travelers, it’s not too complicated to get there, and there are delicious tacos galore. Holbox is my new favorite beach destination in Mexico, and I hope to go back soon! 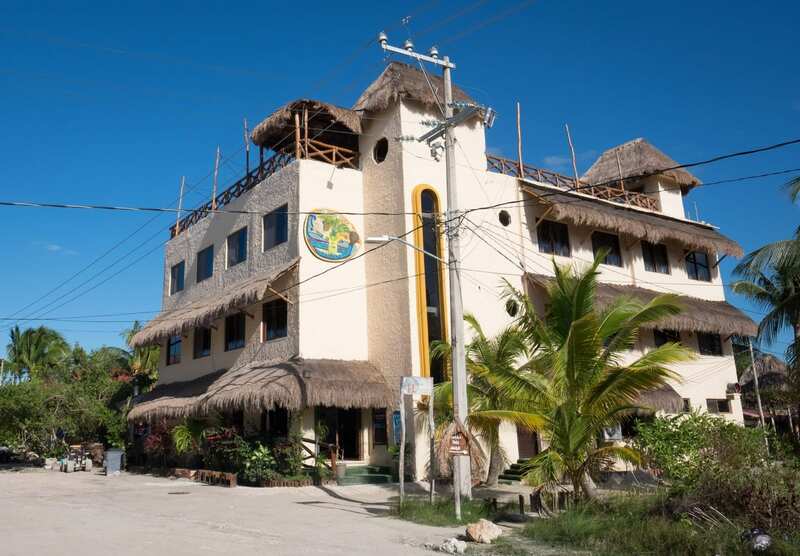 Essential Info: I stayed at two properties in Holbox: the upscale boutique hotel Casa Sandra (rates from $314) and the cheap mid-range hotel Hotel Paseo Kuka (rates from $65). 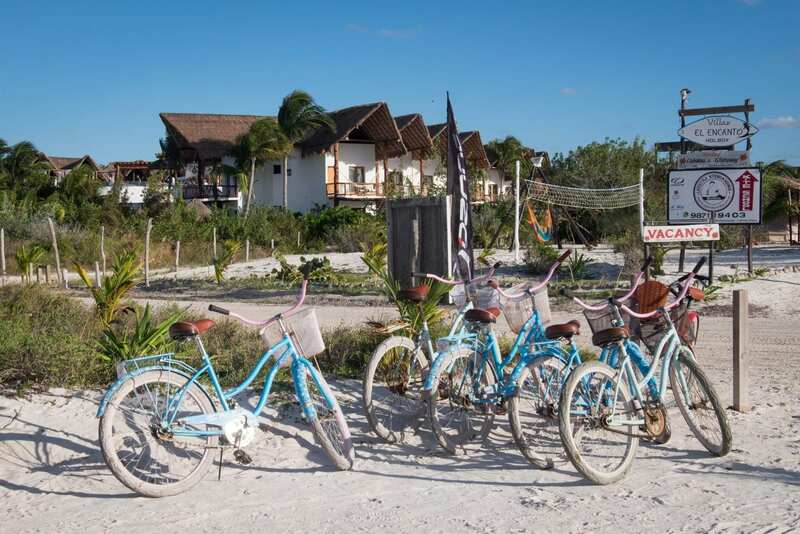 Find deals on hotels in Holbox here. Ferries from Chiquilà take 30 minutes, run every 30 minutes, and cost 140 pesos ($7.30) each way. I booked my shuttle from Cancún Airport to the Chiquilà ferry dock with The Holboxeno for $40. Private transfers start at $113. If you’ve got a lot of money to spend, you can charter a flight from Cancún to Holbox’s tiny airstrip. If you’re flying internationally into Cancún, keep in mind it can take a long time to transfer terminals to the shuttle pickup. I spent 15 minutes waiting for the shuttle and another 15 transferring — the airport is HUGE. Make sure you give yourself enough time, especially since immigration can take awhile. BRING MEXICAN PESOS TO HOLBOX. Most ATMs only dispense USD and few places exchange. Many places that claim to take credit cards actually don’t. The wifi in Holbox is poor, so I recommend getting a Telcel SIM card. There are a few Telcel shops on the island. The water is not safe to drink in Mexico. Avoid contributing to waste by using a Steripen to sterilize your water instead of buying bottled water. 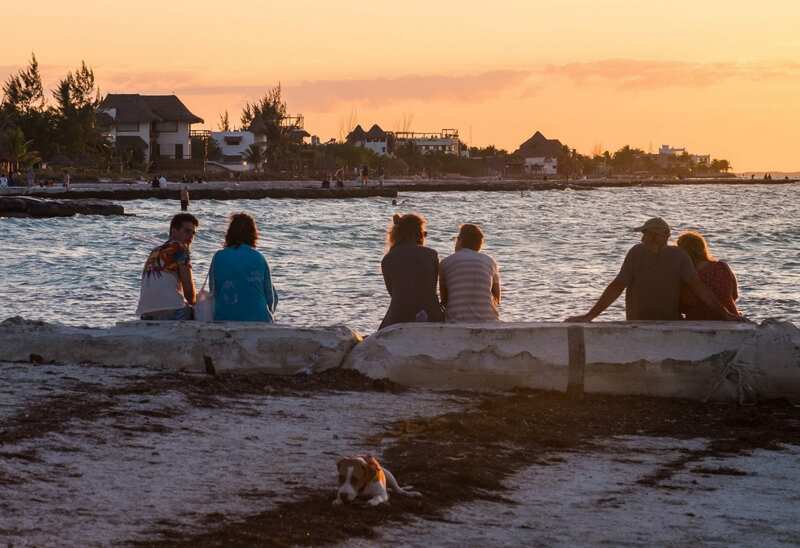 MAJOR TIP: The regions of Quintana Roo (where Holbox is) and Yucatán are in two different time zones. If you’re traveling between Holbox and Valladolid, Mérida, or any points further west, be sure to change your clock. I didn’t realize this until long after I had arrived! 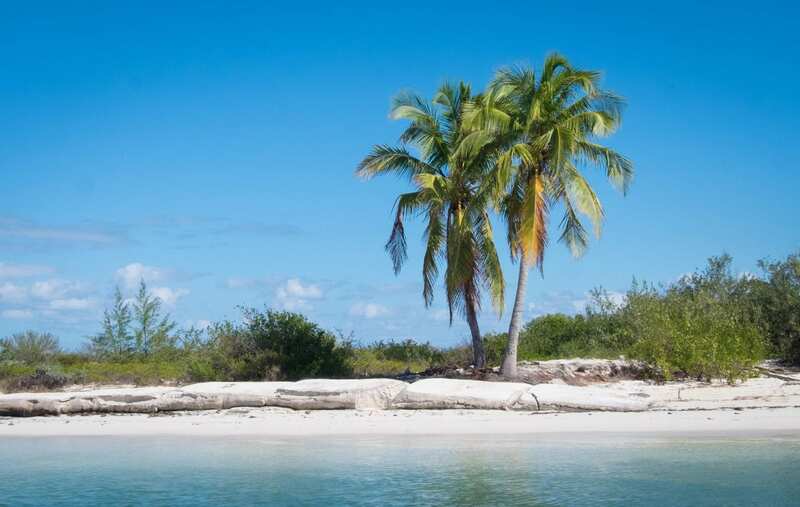 Don’t travel to Mexico without travel insurance — it could save your life or your finances. I use and recommend World Nomads for trips to Mexico. 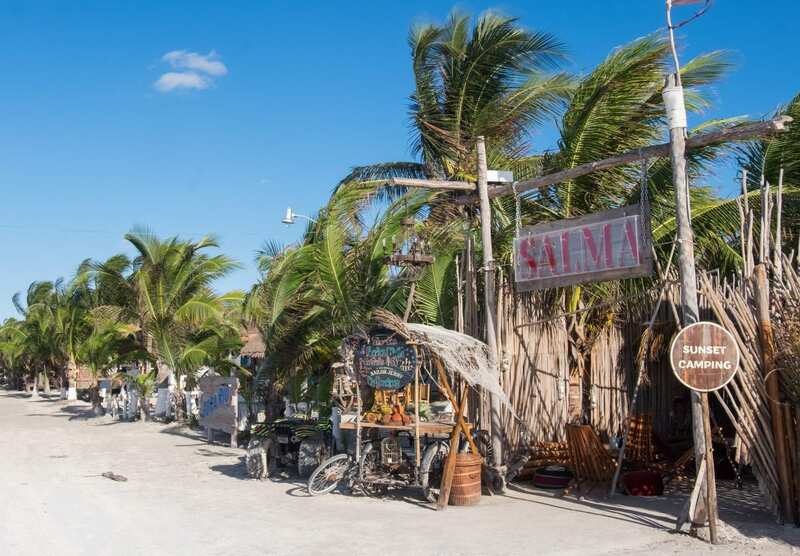 Have you traveled to Isla Holbox? Does it look like your kind of destination? Share away!